“Blotches or circles”… the making of goosebumps! Illustrated and animated by Kim Siew. Article by Debra Tidball. I love this little video that Kim made to coincide with the release of The Scared Book. It’s of one of the goosebumps that appear in the book, and it demonstrates Kim’s trademark quirky style. It’s that style that suited the book so perfectly, turning it into something that is so clever, funny and unique. Kudos to my publisher, Suzanne O’Sullivan at Lothian Children’s Books, for recognising the potential in Kim’s graphic art and muralist background. Here’s the spread that the video references. On this page, the book has developed goosebumps because it’s scared of the cute and funny monsters that appeared at the start. It asks the reader to rub the goosebumps away. When I wrote the text, I guess I really didn’t have any thoughts as to what the goosebumps would look like, except perhaps red blotches or circles. 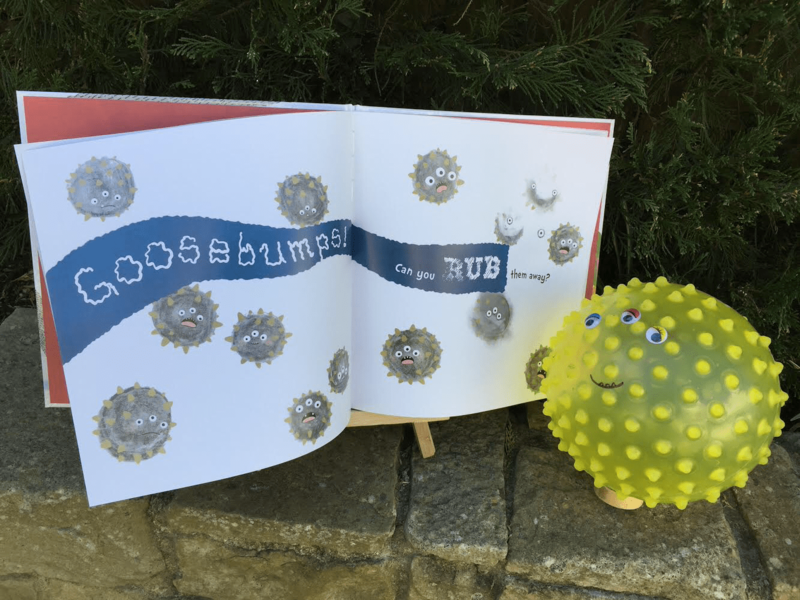 What Kim did with the book elements like these goosebumps was to bring them to life by giving them personalities that I never would have imagined. And the way she integrated this with the overall concept of monsters in the book is magical. Brace yourself… now presenting…THE GOOSEBUMP VIDEO! Brilliant Debra, I love it. Nice work Kim! Love the video, I must say my goosebumps are never as cute as these little guys! Ha! I’m going to talk about that very thing at the launch! Thanks Andrew – I know, right?! Ha! I love the sound effects! Thanks Karen – I can understand that! I hate ghost stories 🙂 Thanks for your kind words! Great video. So simple and so effective! It’s fun, isn’t it ?! So adorable. That little monster just made my day! Thanks Sarah – isn’t it so cute! Kim is so creative – I never would have imagined goosebumps like this! What a fun video! So simple but yet so effective! Kim is amazing – I love it, it’s so cute and funny!